It's been a long time coming, but we're delighted to share the fact that you can now finally make your house smell like Sonic the Hedgehog's famous Green Hill Zone, and it's all thanks to this official candle set. You wanted that, right? Based on the classic item box from the original game, this candle holder comes with a "Green Hill Zone-scented candle". Interestingly, the listing doesn't specify exactly how that smells - we can only assume wet grass and sweaty hedgehogs? - but the candle holder does feature several designs on each side which would look great on any mantelpiece. The candle holder is available now from the official Sega Shop in the UK and Europe and comes from Numskull Designs. You can take a good look at it in the video below (and we've included some product info for you just below, too). The product listing tells you to "take home a piece of Sonic the Hedgehog history" and, if you'd like to do just that, you can buy your very own here for £30 / 34€ depending on your location. Are you a fan of the blue blur? Will you be treating yourself to one of these for your home? Let us know below (and please let us know what Green Hill Zone smells like if you get one). I don't even like sonic like that and I want this. Because if there's one thing I think of when I buy Sonic merchandise, it's... scented candles? They must be running out of ideas for Sonic merchandise. €34?! I'll open a window instead. I sooooooooooo need that TV holder. Local option to purchase in the states? At the very least hopefully an import option. First you can make your poop blue, now you can make your house smell like Green Hill Zone. What's next, Sega? It smells like grass, sea breeze, gas, burnt circuits, and sweat. Why aren't there holes in all four sides? Seems sort of odd. The candle could be emitting light from all four sides, with a different image on each. Also, at the risk of sounding like a total killjoy, could they not have lit a candle and turned the lights off so you can see how it functions? @ReaderRagfihs they'll let you buy the tears of fans after they see the Sonic movie trailer. Is there a candle for a modern flatscreen monitor? where are the chili dog candles??? I like the Sonic series and the games, but this is a pass for me. Just not a candle kind of person. Will admit the candle holder is pretty cool, especially with the candle itself in it. This actually looks pretty cool and i want one, but maybe for $9.99-$12.99 not $30 that sounds a little steep to me IMO. I'm curious if Sega can describe what Green Hill Zone smells like...or how I'd recognize it? I though this was a weird kickstarter, but, no....it's really Sega. They're new Resident Evil 2 candle that makes your house smell like the living dead! Scented candles...? Yeah, because the Sonic fanbase is traditionally part of the Yankee Candle customer base. Whu-huh? Seriously? Green Hill Zone? What the heck happened to Chemical Plant Zone, Marble Garden Zone, Flying Battery Zone, Spring Yard Zone, etc? Cute! I'll keep an eye on this items. 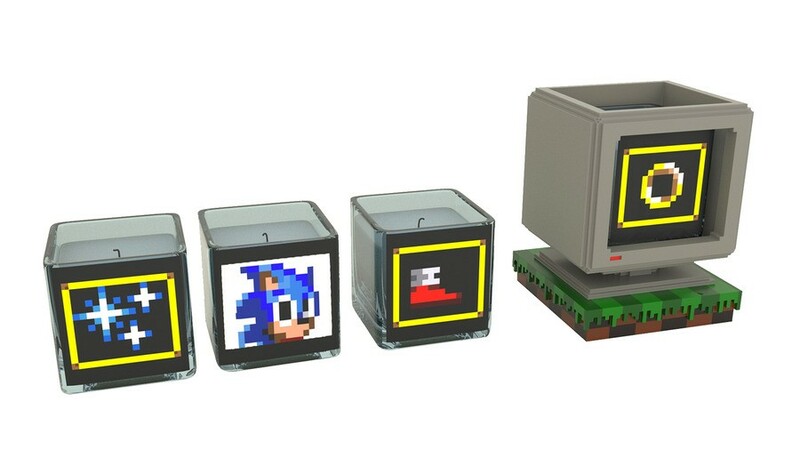 @Spectra Now I refuse to buy anything from Sega until this is added. so no candle lit demonstrations? won't buy unless i see a gamepla- i mean tester. At last, the shoe candle! Definitely firin' that bad boy up. @Reigestugatensho that’s part of the sea breeze. So they smell like grass? If they smell like hedgehogs they smell like poop (hedgehogs are awesome by the way).